Directa Plus was established in 2005 in Italy to develop innovative nanomaterial production processes. The company developed its own exfoliation process (which they call G+) that can be used to produce super-expanded graphite, pristine GNPs, water-dispersed GNPs and fine nanographite powder (all of them marketed under the G+ brand). In 2014, the company inaugurated its 30-ton graphene plant in Lomazzo, Como. In April 2015 Directa Plus received a grant of €5.5 million. The company is involved with several projects and is providing its materials for textile makers, 3D printing, bicycle wheels and environmental applications. Directa Plus is a public company that trades in the UK AIM (DCTA:L). Directa Plus, producer and supplier of graphene-based products for use in consumer and industrial markets, has announced the receipt of two orders from an Italian work-wear customer with an aggregate value for Directa Plus of approximately €500,000 over the next two financial years. Directa Plus’s Planar Thermal Circuit graphene technology will be incorporated in around 10,000 work-wear garments. The first order for approximately 2,000 garments with a value for Directa Plus of €150,000 is expected to be delivered in the 2018 financial year, with the second order for approximately 8,000 garments with a value of €350,000 expected to be delivered by mid 2019. Directa Plus has announced the world’s first road resurfaced with a super-modifier containing the company’s graphene. Directa said the road surface is on a section of Rome’s Strada Provinciale Ardeatina. It is part of a commercial test of Ecopave, which is based on Directa’s Graphene Plus graphene product. Directa has developed Ecopave with Iterchimica, an Italian-based maker of products that enhance asphalt performance and the laying of road surfaces in order to increase safety, environmental sustainability, and efficiency. Directa Plus has reported doubling its first-half revenues as more products containing the Company's graphene additives were launched. Revenues for the six months to June rose to €574,000 (€278,000), while losses reduced to €1.75 million from €2.1 million. Clothing and accessory brands such as Alfredo Grassi, Arvind and Oakley are developing graphene-enhanced items using Directa’s G+ technology, while Grafysorber is a treatment to treat water contaminated with oil. Directa Plus has announced that Oakley, in collaboration with Bioracer, a designer and manufacturer of customized clothing for cycling, have launched the G+ Graphene Aero Jersey containing the Company’s graphene-based products. Unveiled today at the July 2018 EUROBIKE trade show in Friedrichshafen, Germany, the new jersey is designed to leverage the unique properties of Graphene Plus (G+) to dissipate heat from the rider’s body. Directa Plus' printed G+ planar thermal circuit distributes the heat generated by the body and dissipates it when needed to improve the comfort of the wearer and enable riders to use less energy to regulate their body temperature. Fabrics treated with G+ are also electrostatic and bacteriostatic. These properties contribute to moisture management and have an anti-odor effect, and, if placed on the outside of the garment, G+ reduces the friction with air and water to facilitate top sporting performance. Directa Plus, a producer and supplier of graphene-based products for use in consumer and industrial markets, has announced it has received a further order from Alfredo Grassi. 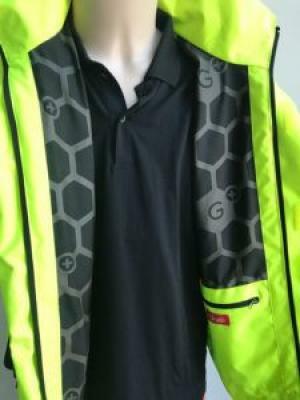 Over a year ago, in June 2017, Directa Plus and Grassi teamed up to develop graphene-enhanced clothing, workwear, uniforms and other textile products. This follow-up order is worth an initial €0.70 million to supply high performance technical textiles with Graphene Plus (G+). It is anticipated that this order will be delivered in the current financial year. The Board believes this order represents the largest amount of textile material to be treated with graphene nanoplatelets by any company in the world to date.